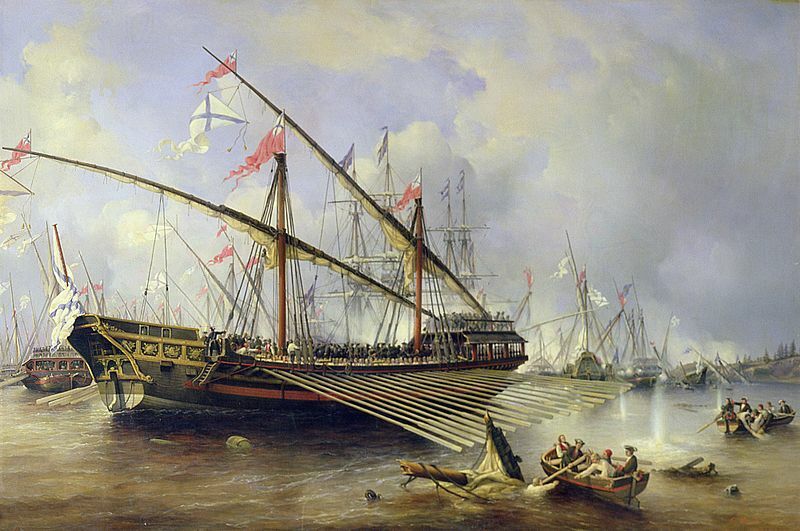 The reality of naval combat involving galleys rowed by slaves seems impossibly remote, even from the perspective of the the great age of "fighting sail" in the late 18th century. Yet Jean Marteilhe's memoirs brings it vividly to life. Here are a few extracts from his account, concerning the actions of the Atlantic galleys in 1702-1714, during the War of the Spanish Succession. He was it seems deceived by our Appearance at a Distance, as a Galley sails very deep, and its real Strength consists only in its Number of Hands, with which it over-powers the Enemy...... As a Galley sails upon such Occasions with prodigious Swiftness, we were soon along side of him, and with all our Force raised the Chamade, or Shout of the whole Crew, which is done in order to intimidate the Enemy. There certainly is something shocking and terrible in the Approach of a Galley. Three hundred Men quite Naked, roaring all at once, and rattling their Chains in the most hideous Manner, impresses the Mind with strange Emotions; they must have Hearts well fortified, who can sustain the Encounter without trembling. In Effect, the whole Man of War's Crew were so much astonished, that they fled into the Hold and begged for Quarter. Our Soldiers and Sailors boarded without Opposition, and instantly became Masters of the Prize (p.64-5). In 1706 Maulévrier-Langeron, the captain of Marteilhe's galley La Palme, became Commodore of the Atlantic fleet (as Major of the galleys in Marseille he was later to play a major role in organising the galériens during the 1720 plague.) The galleys were sent from Dunkirk to fortify the besieged garrison in Ostend, but soon beat a nervous retreat:"We had only the Pleasure of seeing the grandest Firework that could be imagined; for the Sky seemed all in a Blaze with those infernal Engines, which fell as thick as Hail among the beseiged" (p.72). In the following campaigning season (1707) they narrowly escaped being wrecked in a storm,avoiding disaster thanks to skills of their pilot, Pieter Bart, brother of the famous Admiral Jan Ba(e)rt. The squadron had been joined by an Englishman "Captain Smith", a concealed Papist, who was given charge of an operation to pillage Harwich. En route it chanced to encounter a convoy of 36 merchantmen heading for the Thames, accompanied frigate of thirty-six guns, the Nightingale. Langeron decided to attack. The Palme and another galley were sent against the English ship, but her captain, Seth Jermy, held out in order to ensure the safety of his convoy. He feigned retreat, enticing the Palme to ram his stern, at which point a deft manoeuvre brought her alongside and in the line of fire. The Nightingale was eventually overpowered with the aid of the four other galleys, but Jermy barricaded himself in his cabin and refused to surrender until he established that the merchantmen had escaped. Once aboard the Palme, he spiritedly drew his gun and threatened to kill the renegade Smith. Marteihe reports that Jermy was far from heroic in appearance: "He was hump-back'd, pale-faced, and as much deformed in Person, as beautiful in mind"
Here is Marteilhe's "Captain Smith". With respect to myself, for I must bring back my Reader again to the minute Subject of this Memoir; I escaped Death almost miraculously ; the Manner is too strongly imprinted on my poor maimed Body, for any of the Circumstances to escape my Mind. We have seen how the Frigate avoided being boarded, by dexterously turning to lie on our Side, by which we were exposed to the Fire of her Artillery, charged with Grape Shot. It happened that my Seat, on which there were five Frenchmen and one Turk lay just opposite one of the Cannons, which as I readily perceived was charged. The two Vessels lay so close, that by raising my Body in the least, I could touch this Cannon with my Hand. A Neighbourhood so terrible, filled us all with silent Consternation. My Companions lay flat on the Seat, and in that Posture endeavoured to avoid or rather waited the coming Blow. I had presence of Mind sufficient to observe, that this Gun was pointed in such a Manner, that those who lay flat would receive almost all its Contents ; and accordingly was determined to sit upright, since I was chained, it was impossible entirely to quit my Station. In this Manner then I awaited Death; which however, I had scarce any Hopes of escaping. My Eyes were fixed upon the Gunner, who with his lighted Match, was employed in discharging every Piece, one after the other. I saw him approach nearer and nearer to the fatal one, and felt all that Opposition of Passions, so Consonant to my Circumstances, Dread of immediate Pain and Hope of ensuing Happiness. I lifted my heart to my God, in all the Exstasy of fervent Devotion. Have Pity, O Father, on my poor Soul, and as thou hast allotted me to mourn on Earth, may I be comforted with thyself in Heaven. I now felt stronger Assurance of Divine Mercy, than I had ever before experienced, and looked upon Death with Philosophic ; nay more, with Christian Fortitude. I had the Constancy to observe the Gunner apply the lighted Match, what followed I only knew by the Consequences. The Explosion had stunned me, I was blown from my Seat upon the Coursier, which was as far as my Chain would permit. Here I remained, I cannot say how long, lying across the Body of the Lieutenant of the Galley, who had been killed some Time before. The space, however, must have been considerable, as I afterwards gathered from different Circumstances. At last recovering my Senses, and finding myself lying upon a dead Body, I crept back to my seat. It was Night, and the Darkness was such, that I could neither see the Blood that was spilled, nor the Carnage that was heaped around me. I imagined that their former Fears still operated upon my Companions ; and that they still kept upon their Bellies to avoid the no longer threatening Danger. I felt no pain from any Wound, and thought all in perfect safety. I remained in this complacency of thought for some Time, and even took a malignant Pleasure in the Continuance of the Terrors of my fellow Slaves. But at last, desirous to free them from their Fears, I gently kicked him that lay next me, rise my Boy, said I, the Danger is over. I received no Answer, I spoke louder, but still all were silent about me. The Turk of our Seat, one remarkable for his Truth and Probity, who had been chained next me, was lying among the rest; he had been a Janissary, and had frequently boasted of his never knowing what Fear was. I was accordingly resolved to rally the Fellow upon his present Behaviour. What Isouf cried I, where is your boasted Intrepidity now ? for shame rise, the Slaughter is over. Upon this I went to raise him by the Hand ; when, O Horror! My Blood still freezes at the Remembrance! This Hand came away from his Body ; and with its deadly Coldness, chilled me with more than usual Terror. I threw it back with Detestation on the Body of the poor Wretch to whom it belonged, and quickly perceived that my Companions were mashed to pieces, by that very Discharge which I avoided ; and that of six, I alone remained the miserable Survivor. I was sitting in a pensive Posture on the Slaves Seat, and had not been long in this Attitude, when I perceived somewhat moist and cold run down my Body, which was naked. I put my Hand to the Place and found it wet ; but as it was dark, I was unable to distinguish what it was. I suspected it, however, to be Blood, flowing from some Wound, and following with my Hand the Course of the Stream, I found my Shoulder near the Clavicle, was pierced quite through. I now felt another Gash in my left Leg, below the Knee, which also went thro, again another, made I suppose by a Splinter, which ripped the Integuments of my Belly ; it was a Foot long, and four Inches broad. I lost a great Quantity of Blood, before I could have any Assistance ; all near me were dead, as well those before and behind me, as those of my own Seat, Of eighteen Persons on the three Seats, there was left surviving only me, wounded as I was in three different Places, and all by the Explosion of one Cannon only. But if we consider the Manner of charging with Grape Shot, our wonder at such prodigious Slaughter will cease. After the Cartouche of Powder, a long Tin Box filled with Musquet Balls is rammed in. When the Piece is fired, the Box breaks, and scatters its Contents most surprisingly. I WAS now forced to wait till the Battle was ended, before I could expect any Relief. All on board were in the utmost Confusion ; the Dead, the Dying, and the Wounded, lying upon each other, composed the frightful Scene. Groans from those who desired to be freed from the Dead ; Blasphemies from the Slaves who were wounded to Death; arraigning Heaven for making their End not less unhappy than their Lives had been. The Coursier could not be passed from the dead Bodies which lay on it. The Seats were filled not only with Slaves, but also with Sailors and Officers, who were wounded or slain. Such was the Carnage, that the Living hardly found Room to throw the Killed into the Sea, or succour the Wounded. Add to all this, the Obscurity of the Night (for we could not light a Candle, for fear of being seen by the four Men of War already mentioned). All this considered, I say, where could Misery have been found equal to mine ! We continued thus embarrassed for a great Part of the Night, till at last, upon the surrendering of the Frigate, all Things were adjusted, as well as Time and Circumstances could permit. The five other Gallies gave all the Assistance in their Power, putting the Wounded, the Oars, and other Tackling of the Vessel, in the best Order they could. Their Loss was by no Means equal to our's : They therefore, with all the Despatch, and all the Silence in their Power, gave us Assistance. Despatch and Silence were absolutely necessary; for we could discern several Lights leaving the Mouth of the Thames ; and could hear several Signals made by Cannon, which by the Flashes seemed to approach ; by which we were confirmed, that these were Men of War sent out to pursue us. The first Concern of the Sailors was to throw the Dead overboard ; and to stow the Wounded in the Hold. But so much did their Fears of being made Prisoners increase their Despatch, that I verily believe as great a Number of the Living were thrown over for Dead, as of those who were dead in Reality. For in the Confusion of the Night, they flung over all who shewed no Signs of Life; though several, through Fear, or Loss of Blood, were insensible; but, by proper Treatment, might easily have recovered. In this Manner I had like to have found that Death from my barbarous Countrymen, which I had escaped from the Enemy. When the Keeper came to unchain the Killed and Wounded of my Seat, I was fallen into a Swoon, with- out Sense or Motion ; lying among the Dead bathed in their Blood and my own, which flowed from my Wounds in great Abundance. This made the Keeper and his Attendants conclude, that all in that Seat were killed. They accordingly did but unchain the Slaves, and then threw them over, without any previous Examination: It was sufficient for them if the Body neither spoke or cried. In short, those Marine Undertakers did their Work precipitately, that they emptied the Seat in an Instant. My departed Comrades, it is true, were not in very equivocal Circumstances, as they had been too strongly impressed with the Hand of Death to be mistaken ; and they were thrown over Limb by Limb. Mine was the only Body that remained entire; but dead to all Appearance. I was going to be unchained accordingly, in order to keep my Fellow Slaves Company. I had been chained by the left Leg ; and, as I have said already, was also wounded in the same. The Keeper grasped this Leg in his Hand, while an Assistant endeavoured to wrench open the Ring by which I was listened to the Chain. Fortunately for me, the Keeper happened to press his Fingers against my Wound so strongly, that the Pain revived me. I roared out in inexpressible Anguish ; which made the Fellow let go his Grasp. I now perceived their Intention ; and fearing lest they might still put it into Execution, cried out as loud as I could, Pray do not throw me in ; I am not yet dead. They upon this carried me to the Hold, among the rest of the Wounded ; and threw me upon a Cable, made up into a Rouleau. Perhaps the hardest Bed of Repose that ever a Man, in the agonizing Pain I then felt, had to lie on. The Wounded were thrown indiscriminately into the Hold ; Petty Officers, Sailors, Soldiers, and Slaves : there was no Distinction of Places, no Bed to lie upon, nor any iSuccour to be had. With Respect to myself, I continued three Days in this miserable Situation : The Blood coming from my Wounds was stopped by a little Spirit of Wine ; but there was no Bandage used, nor did the Surgeon once come to examine whether I was dead or alive. In this suffocating Hole, the Wounded, who might otherwise have survived, died in great Abundance. The Heat and the Smell were intolerable, so that the slightest Sore seemed disposed to mortify; while those who had lost limbs, or received large Wounds, went off by an universal Putrefaction.